Nothing is more important at Old Village Master Painters than our customers' satisfaction and delight at our work. Here's what some of them have to say. We removed the lead paint from the exterior of the Benzing's lovely Second Empire Victorian home in Chestnut Hill then gave the exterior a beautiful and durable paint job. Our project is nearing completion and we are very happy with the result. We also appreciate Bobby's skill in managing the process and guiding us through the various phases of the work. If I have neglected to mention someone who was integral to the work, please forgive me and know that we are thankful for your efforts. We are sad to see your kindly, friendly workers leave and we wish them all well. 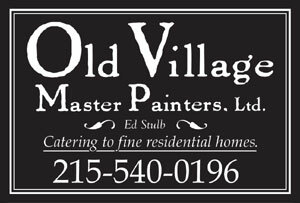 "Our experience with Old Village Master Painters was exactly what owner, Ed Stulb, promised: a company that communicates and works well with its clients, expert workmanship, care for our home and a beautiful end product. We really appreciated that EVERY call to Ed, or his son, was answered in a timely manner and no question went unanswered. The painters and carpenters were top notch, NEAT and friendly. They took excellent care of our home, which is over 120 years old, and comes with lots of "surprises", like shutters that have been rigged up with wire for 50 years or the rotted window sills that couldn't be seen during the proposal phase. These "surprises" never seemed to bother them; they knew exactly how to handle each issue without a big production being made of the problem. Our home looks absolutely beautiful. We would highly recommend Old Village Master Painters and will certainly be calling them again for our next project." "I have worked with Ed Stulb and Old Village Master Painters for over 10 years. Every project that requires painting I do not hesitate to call Ed and to schedule his men for the work. They continue to meet or exceed my expectations. Should an issue arise Ed or his son Hutter always responds immediately to address. I would highly recommend Old Village." Susan and Chris own a beautiful home in Skippack. Old Village did a lot of work in their great room, including applying a special finish to the wooden beams on their coffered ceiling to give them a gorgeous antique look. We also refinished the mahogany railing on their staircase, which really turned out nice. “Being quite a particular client, I cannot say how thrilled I was to work with Old Village Master Painters. From the moment my husband and I first met you, we felt the professionalism and your willingness to really probe for the desired results that we were trying to achieve. Sometimes it is difficult to articulate such detail in a custom finish. The Old Village difference is clearly an approach to pure customer satisfaction rather than just quoting our project and then sending in painters to “get it done”. You offered a working relationship that truly served to make us happy with the final finishes. Our refinished mahogany handrail is just beautiful and was not an easy color to achieve! The new coffered ceiling beams in our family room were so artfully painted to look like aged wood that no one can tell the difference. The beams are spectacular. Hutter, Emilie	, Ed and team - you are amazing! I would recommend you to anyone who wants peace of mind in a job extraordinarily well done." Molly and Greg own a beautiful, c1860's Italianate home in Wyndmoor. Old Village restored the stucco on the walls, restored 3 concrete balconies, and painted the entire exterior of this historic home. "Thank you again for the spectacular paint job, Ed. Though it was a mammoth undertaking, you made it seem simple. Your fleet of painters were a pleasure to have around. They were always on time, very conscientious, neat, and -- most importantly -- seemed to have an authentic appreciation for the special care that a historic home requires. It's a big responsibility to take on that kind of stewardship -- you don't want to use the wrong products, you don't want to cut corners. We deeply appreciated your thoughtful approach to every detail of the job." Old Village Master Painters painted the interior and exterior of Chris and Cheryl's fine home. "My husband Chris is a perfectionist as is the team at Old Village Master Painters. Their attention to detail, visioning and color matching have helped make our home our masterpiece. We very much appreciate their meticulousness and high standards of customer service." Old Village painted the entire interior of this fabulous Penn Valley home for Jen - who is not only the homeowner but also a well known designer. We also restored the beautiful kitchen cabinets with a lovely satin white finish. I want to thank you, Hutter, and your painters for the wonderful job done in our new home. Everyone was incredibly professional, kind, attentive, and reliable. In addition, Hutter and the team gave us excellent advice and recommendations on things we hadn't thought about or noticed beforehand. Our house looks beautiful!!! " "Yes, I would be delighted to serve as a reference. I have been meaning to send you a more formal letter telling you how pleased we are with the work you guys did. Outstanding work, responsive, professional and reliable crew, kept the job site impeccably clean. You guys were not the least expensive option, but in my mind you were worth every penny. I would endorse you with great enthusiasm and plan to have you guys do interior work. Please feel free to bring her onto the property for close inspection and I would be delighted to speak with her personally." Abby's beautiful home is in Gwynedd Valley. Old Village Master Painters wallpapered and painted the entire interior and replaced and painted cedar siding on the exterior. "Old Village Master Painters is a very professional organization comprised of well-seasoned painters, carpenters and wallpaper experts. We recently hired OVMP, and they exceeded our expectations with their level of skill, precision and eye-for-detail. Their “crew” was neat, thorough and efficient. Above all they were most considerate of our home while they were working, and we were living in it…together. We also appreciated that they have a system whereby a project manager leads the job and the same crew starts and finishes the job, especially when it’s a long one. It’s comforting to have the same people in your home day after day. We would highly recommend them"
Old Village did all exterior painting on this fine stone Tudor home in the Mt Airy section of Philadelphia including the gorgeous deep plum on the front door under the roman arch. Old Village has had the pleasure of several repeat engagements at Bob and Mary's fine home in Gwynedd Valley. The exterior has been completely repainted and so far we have completed most of the interior space as well. Just a quick note to express our satisfaction with the work that you have provided on both the interior and exterior on our home. The painters were polite, neat and the work professional. We have used Old Village for over five years now and we certainly would not hesitate to use your services again. Thanks for making our home look great." Old Village completed an interior painting project in a beautiful townhouse (c1850s) in the exclusive Delancey Place neighborhood just off Rittenhouse Square in Philadelphia. Sorry I got busy but meant to email you yesterday. Your men did just an OUTSTANDING job!!!! I can't say enough about how professional, attentive, clean, and fast they were. And our house was put back together in better shape than it was before they came. Excellent, excellent work!! If we need anything painted in the future, we know who to call. Thanks again so much!" I wanted to let you know that Hutter stopped by this morning to review the project with Katie and me. It is nearly finished and we are truly impressed and pleased with the finished product and the quality of the work. The room looks fantastic, will be lucky to have such a beautiful room. I commented to Katie again today how impressed I have been with your company and employees, especially the attention to detail and the genuine interest in assuring your customer is satisfied. We feel lucky that we were able to have you work with us on this project and hope to work together on future projects. I really was impressed with Hutter's follow up, even after the project was completed. The type of customer service he provided is what will continue to set you apart from your competition and will influence us to do future projects with you." Old Village Master Painters removed old wall-covering and prepped the wall. Hung beautiful new cloth wallcovering, painted ceilings and woodwork in large open two story main stairwell of Christie and Jim's gorgeous Gwynedd Valley home. We finally rehung all our art work, mirrors etc. and we are thrilled with the work that was completed. The hallway looks fantastic! It was a big project and Kevin, Winston and Jeffrey deserve a lot of credit for transforming the walls. And the wallcovering hanging by Bob and his team is as perfect as it gets. Stripped, repaired and repainted ~12 window sashes for original double-hung windows on 110 year old house, stripped repainted and weather stripped 2 doors, and repainted walls and ceilings of three rooms. My wife and I obtained a quote from Ed Stulb of Old village Master Painters for restoring windows in our house during an expedited inspection process, and then contracted them between the closing and move-in. Given the short time frame I didn't get multiple quotes, and the price of restoring the windows was comparable to replacing them but we were adamant about keeping the original windows and that the work be performed in a lead-safe manner. Ed and OVMP were highly responsive and got to work immediately, they stripped the sashes back to bare wood, repaired sash pulleys and cords, and helped my wife select a color scheme for the parlor and playroom. I was working in the house and saw personally that the painters really followed EPA Lead-Safe work practices. My only concerns were (i) a week before move-in the painters were pulled off to another job, so the painting went up to the day before move-in, and (ii) on the final inspection we noted that one of the exterior doors had not been done at all, and one window sash pulley came right out when I tried to open the window, all while I was writing an extra check for labor and materials. But, Ed Stulb was responsive to our concerns, they had added painting of two ceilings at no charge to make up for the delay, and thee weeks after move in painter Jeffrey came back and finished up the door and windows to my our complete satisfaction. Overall, the paint job is excellent and the work was done as quickly as possible. We are supremely satisfied!